We look forward to welcoming Trent students and faculty back to the transformed Bata Library after reading break. Drop by on Monday to enjoy some refreshments and take in all of the features of your new library of the future. Starting Monday, Library and Information Technology staff will be on hand and ready to support students at the beautiful new service desk. During this phase of the opening, services at Bata Library will focus on prioritizing access to library, IT and student services, books, resources and study spaces. All student areas and study spaces in Bata Library will also be accessible and available, including group study rooms, study tables, quiet study spaces, a presentation practice room and casual seating areas. This is a soft opening as some areas of the Bata building still require finishing touches. Some research centres and administrative offices will be part of the second phase of the opening. The Archives move will take place in early November and will be operational by late November. An official Bata Library Celebration Event will take place the afternoon of November 16, 2018 – details to follow. Be sure to mark your calendar. Library services and resources include the ability to borrow books from the library collection, access reserves and interlibrary loans and receive research assistance from librarians and library staff. Note that media & microforms collections will be available later in November. NOTE: All other computing locations that were set up temporarily for the transformation have been relocated to the library. View a full list of locations and changes. Graduate student carrels have returned. These heritage pieces have been refinished and will be available to be reserved as of Monday at trentu.ca/library/about/carrels. Please note the Library service desk in the Student Centre and the Information Technology Service Desk in Otonabee College 221.6 have now relocated to Bata Library. As of October 29, 2018, Library and IT services will be open for regular operating hours at Bata Library only. Extended Library hours will be in effect December 3 to December 18, 2018. View a full list of hours. 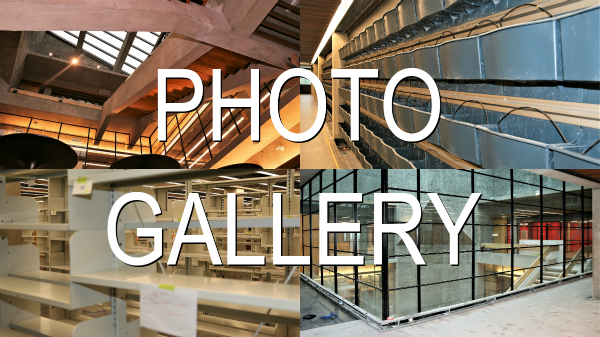 Like today’s most contemporary libraries, the revitalized Bata Library offers many diverse social and experiential opportunities with the aim to promote community and a sense of belonging – one of the hallmarks of a Trent education. Trent is also known for our collaborative learning environment. The new library builds on this environment by allowing students to move seamlessly from collaborative engagement in class to collaborative study spaces in the library. Trent’s library of the future is also well-equipped to ensure our students, faculty and staff can meet future demands around technology and new models of educational delivery. New technological infrastructure allows users to search everything within Trent’s resources and outside of Trent at the same time – ensuring all materials can be accessed anytime, anywhere. Much attention has also been paid to preserving and refreshing much of the original Ron Thom décor and furnishings. Get a glimpse into construction progress over the past year during this $18 million renovation. Trent University has partnered with the Internet Archives to digitize and preserve 250,000 books from the Thomas J. Bata Library through the Open Libraries project. Advancement reports the successful completion of the $2 million fundraising campaign for the Bata Library and has since raised a further $145,000 for a Bata Library Furniture fund to restore, refurbish and return some of the precious original furniture. During convocation, Alumni Affairs hosted a reunion for the Classes of 1964 and 1965 and several of Trent’s founders attended, including Professor Tom Symons, founding president of Trent University. Among the special guests were Paul Merrick, the lead architect who worked with master architect Ron Thom on Bata Library and Molly Thom, widow of the late Ron Thom. Mr. Merrick said the work was “dazzling” and expected the new library to be even more spectacular than when it originally opened. Why has the opening been delayed? The plan for Trent’s library of the future, presented to the Trent community in early 2017, has been implemented. In some instances, spaces had to be relocated on the plans to better accommodate the structural limitations of the 49-year old Bata building. Challenges associated with pre-existing structural and mechanical conditions, some present since 1967, added eight weeks of construction time to the project. Additionally, the general contractor has encountered some business and resources challenges that have slowed progress late in the project. The remaining work entails a number of different pieces. For instance, there are some changes to the HVAC and other building systems mandated as a result of the building inspection process. In addition, some finishing work (e.g. cabinetry, painting, installing door locks, etc.) is still to be completed. With the phased move-in approach, there may be workers on-site making minor repairs, touchups, etc. intermittently, after the building opens.